Neither in painting nor in music has impressionism become synonymous with a profound confrontation with faith. That is, until the Swiss composer Frank Martin (1890–1974) opened the compositional doors of his era and enabled a new approach. In his early years he was already capable of grappling with the depths of a Kyrie, the gravity of a Gloria or setting a Credo to music – by composing his impressive Missa für zwei vierstimmige Chöre (Missa for Two Choirs in Four Parts). Sound images appear in which the power of liturgical forms of expression introduce and reveal the worship service in an unexpected manner. The mass is juxtaposed with twenty-first-century compositions by Matthias Grünert. In the Agnus Dei and the Pater Noster, this composer likewise proves himself to be a master of the expression of our time characterised by spiritual-liturgical form – the Musica Sacra. The two compositions come together here under the auspices of the ten-year anniversary of the reconstruction of the Frauenkriche Dresden – the site that, as a re-established symbol of peace and reconciliation, radiates light and purity into our world. 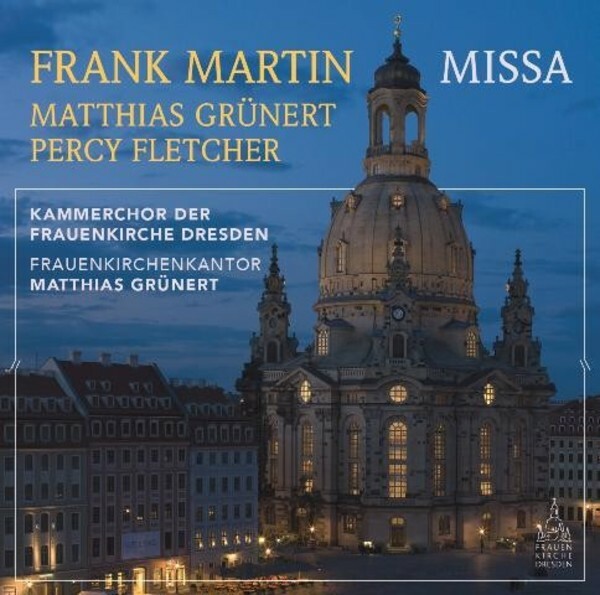 The works are interpreted here by one of the church’s ambassadors for peace, the Kammerchor der Frauenkirche under the direction of Frauenkirchenkantor Matthias Grünert.